A major blessing arrived in our home this week as we adopted a German Shepherd Dog named Banner. 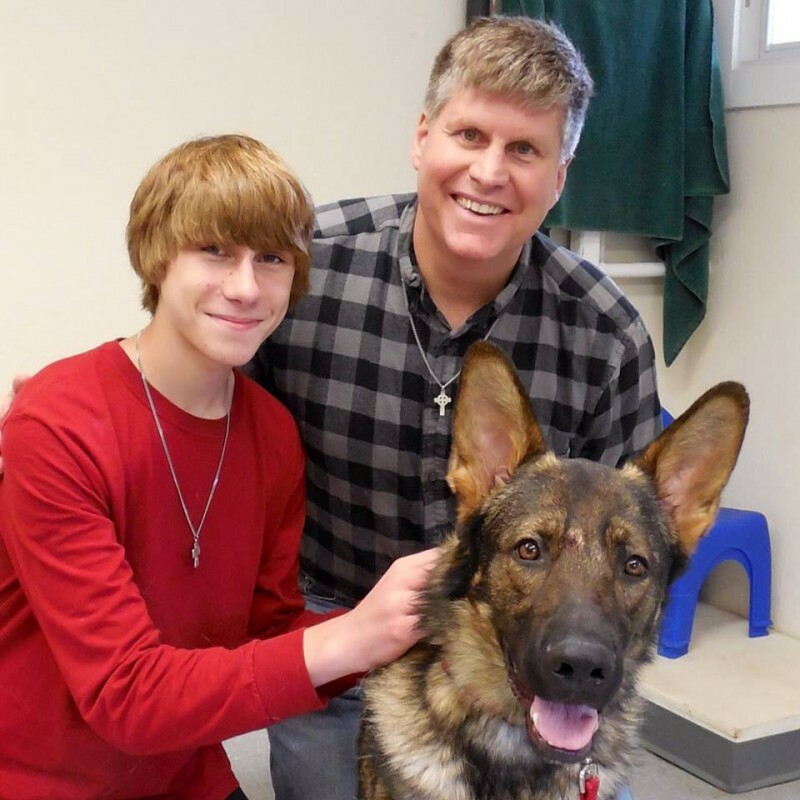 Banner was released from a Seeing Eye dog-training program because he likes to chase cats! We love Banner, and looking at his medical history I saw that about a year ago Banner was treated for a very painful disorder that some big dogs get when they are growing rapidly. The Vet was able to prescribe some medications to help him tolerate the growth pains, but the main solution to the growth pain was to wait it out. It struck me that our church is going through a similar phenomenon. As we grow at All Saints some of us may experience a bit of pain in the process. The pain may be small, like the inability to find a parking place, or someone sitting in our favorite pew. Or it may take the form of something larger, like changes is music style that distract us in our worship and make it difficult to connect to God in the way we normally do. Whether big or small, thankfully we can do more than just wait it out. I’d like to suggest a few ways we can make the growth pains less painful as All Saints grows and develops into the awesome church God created us to be. 1. Tell me how you feel. Try to use “I statements”, and specific examples like one person did in a wonderful way recently, saying: “When you play contemporary songs and don’t provide written music for me I feel left out and don’t know how to worship. It would really help me if I had written notes so I could feel like I can worship God effectively.” That’s a wonderful way to communicate in a way I can use to help ease the growing pains. We can solve this type of problem many ways – for example starting different services with different styles, purchasing music so people can follow along, or perhaps communicating better that while we are in transition we are seeking to have a mix such that everyone has a chance to worship in the ways they feel most comfortable at least some of the time. The way this person brought their opinion is much more effective than projecting one’s opinion on the whole church and saying things like: “We hate it when you don’t provide written music.” This is less helpful to me because the nameless “We” coalition feels coercive and is hard to gauge. It could be two people, 10 people, or a group of people that were in the room but did not disagree when the opinion was voiced. I know the “We” does not include the many people, for example, who came up and voiced the completely opposite opinion and want to do more contemporary music in an unstructured way. Your opinion matters all by itself! Come tell me how you feel. And if others feel the same way encourage them to talk to me, or those on the Vestry as well! And please have patience as we consider your views and seek to move the church forward, integrating everyone’s preferences and discerning how the Holy Spirit is moving us at All Saints. 2. Move in the positive! You won’t have to look far around All Saints (or at its Priest) to find something that is not perfect. But if you want to have an impact for Jesus you won’t have to look far to find a place where you and your gifts can help. What are you passionate about? Jesus probably put that passion there, and if we can tap that passion and direct it in a positive way heaven is the limit for what Jesus can do through us! If you see something you don’t like, consider how you could move in the positive to move a negative into something awesome for our church family! 3. Focus on the Mission! Our mission is nothing less than bringing people to Jesus! That is the mission of every church, as Jesus commissions us, to “…go and make disciples of all nations” (Mathew 28:19). Our mission is not self-preservation, not serving ourselves or even each other by creating a comfortable environment, but transforming our world in the name of Jesus! Awesome worship, great pastoral care and deep relationships are a huge part of that – every single person in our church is important! But I’m so blessed that the Vestry and Wardens of All Saints are passionate about growth! I was so energized when they brought me in nearly six months ago not as a chaplain to take care of a church that wanted to stay the same, but rather a leader to drive a church that wants to do the mission of Jesus: healing the sick, bringing good news to the poor, binding up the broken hearted, setting the captives free (Isaiah 61)! We have a huge opportunity to have an impact on Round Lake, the Malta area, and the capital district in the Name of Jesus! This will require change, growth, and yes some growing pains. In fact – it is a good sign. Apparently the bigger the dog, the bigger the growing pains. Banner is doing great! And All Saints has an awesome future serving Jesus and doing our part in transforming our world and ourselves! Thank God for Growing Pains – that means we are Growing! Through voicing our feelings, moving in the positive, and focusing on the mission we can mitigate and direct those growing pains to launch us forward. I’m so blessed to serve as your Priest in this adventure!